Eight or nine years ago, I never ever made up a grocery list before hitting the grocery store. I’d stop in there a few times a week after work, pick up whatever I thought I could throw together for supper the next night or two, and probably pick up a few other goodies as well. I’d stop perhaps three times a week and I wouldn’t blink an eye at a $80 or $100 tab, even though it was just for Sarah and myself. Today, I really don’t like going into a grocery store at all unless I have a grocery list in hand. In a given week, we’ll spend far less than we did back then, but now we have three children to feed as well. What’s the difference? Part of it is having a better head on my shoulders when it comes to decisions about what foods to buy, but the humble grocery list is perhaps an even bigger part than that. Without it, you’ll be relying strictly on memory in the grocery store, which is problematic in several ways. Depending on how unprepared you are, you may not even have ideas for meals in advance, which means you’re wandering the aisles hoping for inspiration. That makes you a gigantic target just waiting for marketing to take advantage. Without a list, you’re relying on imperfect memory to recall the staples you’ll need. Do you need milk? How much? Do you even remember to think of milk? How about bread? Cheese? Bananas? You’re also relying on memory for recipes, special occasions that are coming up, and so on. Again, you’re often relying on inspiration here, wandering the aisles and hoping you notice and remember things you need. A grocery list removes all of this. With a well-prepared grocery list, you can rely on that and nothing else. You just head for the products you need. 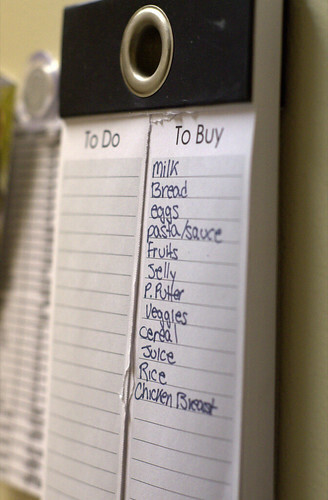 Even without developing a meal plan, a grocery list is a useful thing. Just leave it out on your refrigerator and jot down items as you notice you need them. If you have that in hand, then you don’t need to worry about staples, which means you spend less time staring at the shelves. Why is staring at the shelves a bad thing? Marketing. Product packaging is designed to influence your thoughts and convince you to put that item in your cart. No matter how much self-control you have, the more time you spend staring at the shelves – particularly when you’re not simply searching for a specific item – the more likely you are to buy something unnecessary. A grocery list is a key tool in that battle. It keeps your eyes off the shelves, and even when they are on the shelves, they’re searching specifically for an item. The amount of time your eyes idly wander the shelves is drastically reduced. A grocery list is a frugal shopper’s best friend. Don’t leave home (for the store) without it.